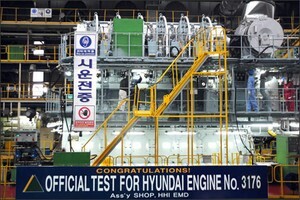 The world’s largest ship builder, Hyundai Heavy Industries is here with what will be the world’s first environment-friendly marine engine. This 16,680-horsepower engine reduced nitrogen oxide (NOx) emissions by 15 percent on a trial run. Built in collaboration with German-based MAN Diesel, the engine was delivered to China’s Yangfan Shipyard for a 92,000-ton bulk carrier on Wednesday. It meets the latest Tier II regulations set by the International Maritime Organization (IMO). The IMO set more stringent regulations in 2008 that ruled for lower NOx emissions for marine engines reducing it from 17 grams per 1 kilowatt-hour to 14.4 grams. Ships built from January 2011 onwards will abide by these regulations and use engines that meet these standards. Hyundai developed components such as turbochargers, fuel valves and air coolers that renew the design of its engine and help meet these regulations. Hyundai’s production reached 94 million horsepower in 2-stroke engines and 20 million horsepower in 4-stroke engines as of last year. These guys are sure working hard to go keep the waters clean. Hyundai’s Sonata Hybrid is green at heart!